John G. Corse Funeral Directors not only care for the deceased, but also take care of all arrangements for the deceased’s families at a stressful and difficult time. The services include; making full arrangements for either burial or cremation – giving full advice on the registration of a death and any other necessary documentation, arranging ministers or celebrants, churches and organists, arranging notices in newspapers, supplying funeral vehicles, designing and printing personal order-of-service sheets, arranging funeral teas and arranging a suitable memorial or additional inscription to be added. Funerals can be carried out from a church or home anywhere in Orkney, followed by a burial in any Cemetery. Arrangements can also be made for burials on the mainland or for a service at any Crematorium. Should death occur away from home, e.g. in hospital or nursing home, on holiday (inc. abroad), staying with relatives or moved away from Orkney, we can arrange all the repatriation home to Orkney for burial in the preferred cemetery, or from Orkney to preferred cemetery or crematorium. Through John G. Corse Funeral Directors you can purchase a Golden Charter pre-paid funeral plan, The UK’s leading funeral plan provider, it offers peace of mind by allowing you to plan and pay for your funeral in advance, tailored to your own requirements. It is advisable to talk to us directly, so that your plan can be suitably adapted in accordance with all local charges. At John G. Corse Funeral Directors, we are proud to have achieved 2016 Regional Funeral Planner Of The Year for the North of Scotland. If you are interested in any further information about our prepaid funeral plans, then call us or use our contact form at the bottom of the page. Having now been a supplier of memorials for some years, we have extended our services and now do additional inscriptions and memorial renovations. Please ask to see our brochure or click on the ‘Our Memorial Collection‘ link. We also have a small selection of memorials on display at the funeral home. 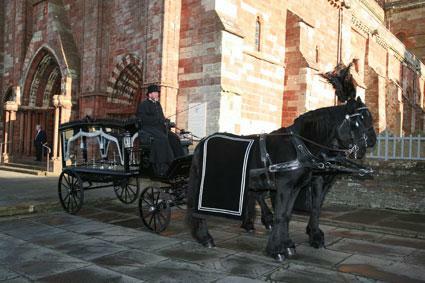 George Louttit’s beautiful funeral carriage (above), in traditional style, with full livery, black plumes and drapes is available to hire through John G Corse funerals.